On the AT and PCT the most common health problems are knee injury from downhills and Achilles injury from uphill climbs. On the Florida Trail the most typical physical injuries are knee sprain from sucking mud and rolled ankles due to soft sand and roots. But as always, it is the heat and humidity that are the biggest threats to your health on the FT. Threat of severe dry eye confronts anyone who spends a lot of time outdoors: construction workers, landscapers, paddlers, hikers, et cetera. It can be painful and the key is prevention. 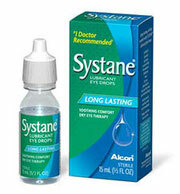 First, have lubricant eye drops and use them often, before redness and irritation appear. Do not use Visine or similar products that contains vasoconstrictors. These constrict blood flow to the eyes and cause “rebound redness.” In other words, Visine makes the problem worse. Instead, choose brands like Refresh or Systane. Second, always wear sunglasses that block 100% of UVA & UVB rays. You will be dirtier on the Florida Trail than on the PCT or AT, especially in Big Cypress. If dirty hair gets into your eye, it can cause a bacterial infection. Your hair should either be short enough it can't get in your eyes or long enough to keep it pulled back (recommendations for no-slip hair ties are here). "Pink eye" can be either bacterial or viral. Viral infections require prescription medicated drops and easily spread between people. Pink eye outbreaks at schools or among family members are usually viral. On the other hand an infection that develops on-trail is almost certainly bacterial, and while painful during the first day (especially the first few afters after symptoms appear), it is not an emergency. Unlike viral infections, which just cause redness, bacterial infections create thick, yellowish discharge that can make eyelids stick together, especially after sleep. Bacterial infections go away on their own in about a week and don't spread person-to-person that easily. Hikers who wear contacts will need to get off-trail to a place with clean running water and soap where they can wash their hands, take out their contacts, and flush their eyes with warm water. Throw infected contacts away and wear glasses until the infection is over. The discharge caused by bacterial infections can feel gritty/scratchy. Rubbing your eyes will irritate them more, so the best thing to do is buy a sterile eye wash + eye cup combo at someplace like Walgreens, CVS, or a supermarket. Place the cup over your eye, squeeze the bottle, and flush the discharge from your eye without using your hands and thus potentially re-infecting the eye. The Florida Trail is not like the long green tunnel of the AT. Hikers are regularly in out in the open subtropical sun with no shade. Because of Florida's latitude, you can become sunburnt even in winter, and even on a cloudy day. We have been sunburnt on cloudy days many times. We recommend wearing long sleeves and wide hats, as well as applying SPF 50 sunscreen to your face. Your nose and cheeks are the most vulnerable. If you have had skin cancer or melanoma in the past, or are at risk for skin cancer, you will need to be extra cautious during your thru-hike. 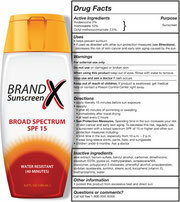 So that you get the most bang for the extra pack weight, we recommend you carry only SPF 50 sunscreen. In 2012 the FDA revised rules for the labeling and marketing of sunscreens, and announced that the effectiveness of sunscreen plateaus at SPF 50. Higher SPF numbers do not provide more protection, so don't waste your money. Your lips can become sunburnt and windburnt just as easily as your skin, and prolonged exposure to UV light can trigger the virus that causes cold sores. Mountaineers know this, since UV radiation is stronger at high altitude than at sea level, and wear high SPF lip balm as a result. Thru-hikers are exposed to months of subtropical sun and so should do the same. Classic cherry ChapStick has little SPF protection, so look for lip balms that explicitly state their SPF rating. Examples include ChapStick's Sun Defense line and Banana Boat Sport Performance Sunscreen Lip Balm. Heat rash is a serious issue on the FT, particularly for guys. Since Florida is a humid place, even in winter, your sweat does not evaporate quickly. While we recommend you wear long pants for numerous reasons, one of the drawbacks is that more heat and moisture gets trapped around your legs. Heat, moisture, and friction will lead to heat rashes, and no place is more susceptible than your legs, upper thighs, and groin. Heat rash can be painful, especially on the testicles, and chaffing only gets worse once it appears. If you develop painful heat rash and chaffing, you'll need to take a zero day to let it heal. The key to prevention is to wear underwear made from polyester or some other synthetic material, and apply Gold Bond powder in the morning before leaving camp. Within hiking circles cotton is maligned for exacerbating hypothermia, but nevertheless many hikers still wear cotton underwear. Usually this is not a problem, and on another trail (like the AT or PCT) we might even encourage it since synthetics tend to smell bad and thru-hikers go weeks without laundry. However, since cotton dries so slowly and Florida is so humid, cotton underwear traps moisture (and subsequently heat) that cause painful rashes. 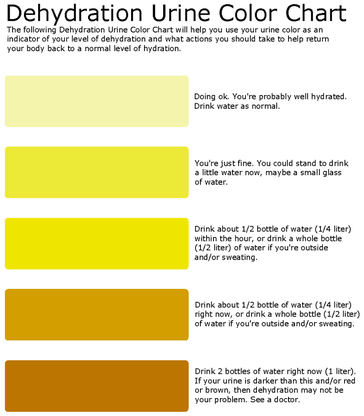 While completely preventable, dehydration happens anyway, usually because of laziness or impatience. Filtering water takes time. Stopping to get water means getting to camp late. You want to keep going, to get the miles in, so you ration what you've got and don't drink as much as you should. You tell yourself you're fine and that you'll filter water in camp. You cameled-up before leaving camp that morning. It's not that hot. You're used to the heat. Just three more miles and then you'll stop for lunch. You'll get water then. We've all been there. Fight these inclinations. Your urine should be copious and clear. If not, you aren't drinking enough water. Florida is a humid place, even in winter. The high humidity means sweat does not evaporate quickly, which means heat is not carried away from the body fast enough to keep you cool. Heavy physical exertion like backpacking, combined with Florida's high temperatures and humidity, make heat illnesses a real danger. The final stage, heat stroke, will be fatal if it happens to someone on the Florida Trail. The danger of heat stroke when in remote, rural areas cannot be overstated, so let's explore the progression of heat illness to understand how to prevent it. 5) cramps in the stomach, arms, or legs. Treatment of heat cramps is common sense: stop what you are doing, get out of the sun, sit down and rest, and drink lots of water or Gatorade (but never beer). Trouble begins when we ignore the signs of heat cramps and push ourselves to keep going. Symptoms of heat exhaustion are similar to but more intense than the symptoms of heat cramps. The line between heat cramps and exhaustion is blurry, but progression from one to the next means you are dehydrated or have lost too much salt from sweating. In other words, it feels like a terrible hangover. Imagine waking up hungover and then going out into the midday sun. You have a headache, your body aches and feels hot, and you're on the verge of vomiting. We have fainted while playing football and vomited while mountain biking. It happens to the best of us, and when it does, you can treat it the same way you would treat heat cramps: stop what you are doing, get out of the sun, sit down and rest, and drink lots of water or Gatorade (but never beer). If possible, jump in a pool or lake, lay in a creek, take a shower, or get inside where it is air conditioned. No one is too tough to get heat stroke. No one can be "used to the heat." So once you have heat exhaustion, drinking water and Gatorade is not enough. If you drink up but do not stop what you are doing and get out of the sun and heat, your core body temperature will continue to rise and you will get heat stroke, which will wreck your internal organs and possibly kill you. Heat stroke happens when your core body temperature reaches 104 or 105 degrees (depending on who you talk to). It is a medical emergency. and you must go to the hospital immediately. When someone's body temperature remains at 104 or above for more than a few minutes, they enter a death zone. Their organs shut down, the brain is damaged, and they never regain consciousness. This is why heat stroke on the Florida Trail will almost certainly be fatal. The trail is remote, and even if you get a cell signal, an EMS team will not be able to reach your location and get the person to a hospital in time. Also, while waiting for the EMTs, you will not be able to get the person indoors, into a shower, and dump ice on them, which will save their life. The best you could hope for is dragging the person into a lake or spring. Fortunately, heat stroke is entirely preventable. The paradox of Florida in winter is that you can be threatened by hypothermia and heat stroke on the same day, which presents an interesting challenge to hikers. Hypothermia doesn't just happen in sub-zero temperatures. You can get it in 60 degree weather if you are damp. Also, if you are exerting yourself (like while backpacking) and then stop hiking, your body temperature can drop rapidly. To prevent this from happening to runners after a marathon, they are wrapped in thermal blankets at the finish line. The keys to avoiding hypothermia when thru-hiking in Florida are staying dry and layering clothes up and down quickly. During Florida winters, while the air may be frigid, the sun nevertheless remains bright, and so you will warm up and sweat. The ability to layer up and down easily is essential. Jackets with full-length zippers are better than pull-overs. The expression "cotton kills" has been around for decades. Do not wear cotton while backcountry hiking. Cotton is cool and comfortable against the skin, but it also dries very slowly. Because of this, when you sweat or become wet while wearing cotton, that moisture remains against your skin and draws heat from your body. Wearing cotton in damp conditions can lead to hypothermia, even in mild temperatures like the 60s. The key to warmth is to make sure air does not flow across your body. You do this by trapping air in small places close to your body to create "dead air." Your body warms this unmoving dead air and it keeps you warm. So in effect, it is not the clothing that keeps you warm but the air trapped by the clothing. Unlike cotton, synthetic fibers such as fleece create dead air, even when wet, and they dry very quickly. Florida's soil is largely what we call sugar sand — essentially beach sand. If you've been to the beach you know how your feet can twist, sink, and slide in the sand. During swampy sections slippery, sinking mud can twist your ankles. The weight of your pack leads to more twisting, sinking, and sliding. While we do not recommend that thru-hikers wear high-top hiking boots rather than running shoes, we strongly recommend that you use trekking poles. Florida may be flat, but trekking poles are valuable nonetheless because they allow you to catch yourself and prevent serious ankle injuries. 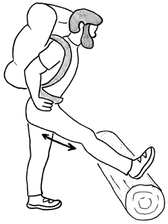 With every step hikers take, the weight of their backpacks comes crashing down onto their knees. Regardless of pre-hike training, nothing can prepare the knees for 6-8 hours of pounding every day for months on end. In the first month of a thru-hike, especially the first two weeks, knees swell and can become so painful and stiff you can hardly walk around. The exact, medical prognosis of knee pain and swelling could be many things: a sprain or strain (tears of a tendon), tendinitis (inflammation triggered by overuse), Ilio-tibial band syndrome, or patellar compression syndrome (a dull, constant ache behind the kneecap). On the Appalachian Trail, hikers are especially at risk for knee hyperextension, which is when the knee bends backwards beyond the normal range of motion. It happens during downhills when the foot lands while the leg is straight, and the force of the impact bends the knee backwards. Many times people hear a pop! when this happens. (Soccer and football players get it when they plant their foot into the ground to stop suddenly). Since there are no steep downhills on the Florida Trail, the risk of accidentally hyper-extending your knee is virtually non-existent. A sprained knee in Big Cypress or Bradwell Bay Wilderness can be the result of ligaments overstretched by sucking mud. The deep, sucking mud in these swamps can create a strong suction so you must be conscious about how you are lifting and extricating your leg from deep mud. If you feel resistance from suction, do not pull straight up. Try wigging your leg or angling your foot to allow air or water to get under your foot and thus break the seal of mud causing the suction. Rest – Stop hiking and rest the knee for at least a day, though two or three days is recommended by doctors. You don't want the joint to stiffen however, so don't immobilize the knee. Ice – Regularly apply ice packs to the knee for the first day or two. Compression – Wrap the knee tight (but not too tight) with an Ace bandage or self-adhesive gauze wrap. This helps reduce swelling and pain. 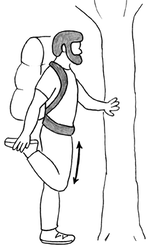 Elevation – Elevate the knee by lying down on your back with the knee raised and supported by something like your backpack, a stuff sack, et cetera. This reduces swelling by getting fluid to drain out of the knee. We have devoted an entire page to the issue of foot care here. You are your own biggest health-hazard in the backcountry. If you get sick in the backcountry, you probably did it to yourself through poor hygiene. Tips for keeping clean are discussed on the sanitation page. Mosquitoes and all the other unfriendly bugs you'll encounter in Florida's backcountry are discussed on the insects page.